Note (1) : According to Intel offical documents it support FSB 800 MHz only. EX945-GC is built with Intel 945GC Express and ICH7 chipset supports a wide range of Intel CPUs, including Core 2 Duo/Core 2 Extreme, Pentium D, Celeron D, Pentium 4 and Celeron processors in the LGA775 socket. It can be installed with the fastest Dual Channel DDRII memory modules running at 667/533 MHz up to 2 GB. The 945GC Express chipset delivers outstanding system performance, high quality video with PCI-E (card length up to 270mm) and 7.1 channels HD audio outputs. 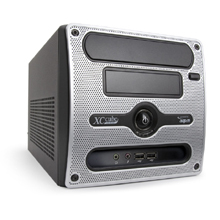 These features made EX945-GC a high performance system and a Windows Vista Premium 32/64bit ready PC. The S1 Version supports Intel Core 2 Quad, Core 2 Extreme processors with FSB 1066 MHz and the latest Intel CPU with FSB 1333 MHz (Stable running at 1066 MHz). This feature gives user more selections when purchasing CPUs. You can get the detail CPU support list at AOpen RCL pages. The 945GC Express chipset of EX945-GC delivers outstanding system performance and various expand features such as dual-channel DDR2 for high speed memory modules, PCI Express x16 graphics port can install high-end graphic cards, PCIe x1 can equip TV Tuner, or Wireless card. And its chassis can hold one HDD (Serial ATA2/IDE), one ODD, and another one 3.5” HDD or Card Reader. It can load one 3.5” hard drive, one half-height optical drive, and one optional card reader ensuring EX945-GC’s expend ability. With AOpen Silent Technology and patented side-blown fan cooler with air duct, intelligently guides the air to dispense the heat from the hot spots out of system, EX945-GC will just generate 28db noise during operation. Therefore, AOpen EX945-GC is the most powerful and silent small form factor system today. With the SECC case, AOpen EX945-GC weights 6.7kg only. And its dimension 190 (H) x 320(L) x 200 (W) mm make it a 12L small form factor compact system is very suitable for tide room and narrow space. This size is perfectly for placing it in living room, study room, and dorm; or using it as a secondary and back up PC. * Accroding to Intel offical documents it support FSB 800MHz only. ** Accroding to Intel offical documents it support 2GB only.